Happy Birthday to CJ Peroddy. Prom tickets are on sale before and after school from Mrs. Aldridge. See posters for pricing. All funds and people must be present for group pricing. Would you like to try something new and make next year’s freshman a part of YHS? Link Crew Applications are available for this year’s sophomores and juniors. The are available in Mr. and Mrs. Aldridge’s room and also in Ms. Dori’s office and on the school website. The deadline is at 3:00 on Friday, May 3. Late applications are not accepted. The LCSD scholarship is open to all YHS seniors. General form packets are due to the counselling office on April 24. Students interested in participating in the Special Olympics Nevada 2019 Track & Field Unified Sports Relay event on Tuesday, April 30th, at Reed High School in Sparks as a partner should sign up in room 15 ASAP; general education slots are limited so volunteers will be taken in order of sign ups. 2019 prom tickets are now available. One ticket is $45 and two tickets are $80. A group of four is $130 and a group of 10 is $300. Tickets can be purchased from Mrs. Aldridge and Mrs. Mueller. Art Club will be meeting at Round Table Pizza to paint windows on Friday, April 19th. Seniors: You may now pick up the Graduation Cap Decoration Request from Mrs. Wildermuth in the Principal's office. These will need to be filled out, in detail, and return no later than May 1st. 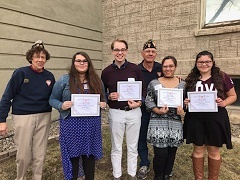 Five YHS students, Joe Page, Erika Ramirez, Shania Bebo (all three seniors), Alexus Bodenstein (not pictured) and Kaylee Palmer compete in the Fleet Reserve Patriotism-Americanism Essay Contest in Carson City. Congratulations to Miley Page. 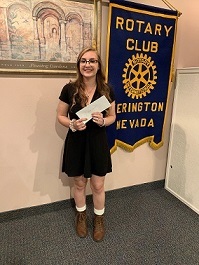 She placed first at the 2019 Rotary Speech Contest and will be moving on to the area competition. Fill Out Your FRL Application Today! 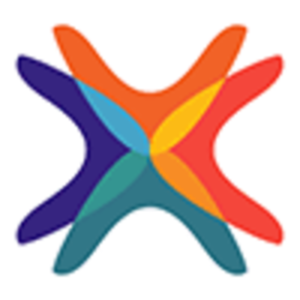 High School and Adult Ed students login here. Elementary student and teacher login here.